Throughout the years we have received many great pictures from our customers and we appreciate it very much. 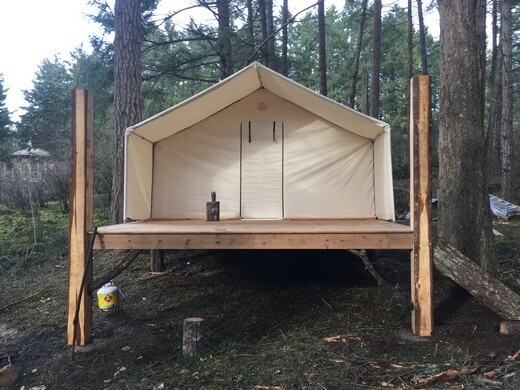 Dave Branson built a great platform for his tent and frame. Crystal and Ryan’s wedding/deer camp 2014. 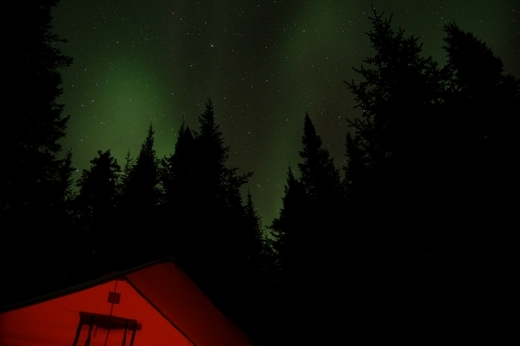 Logan Donovan of Dawson City, Yukon sent these – check out the Northern Lights. The tent is working out awesome! It kept me warm at -47. 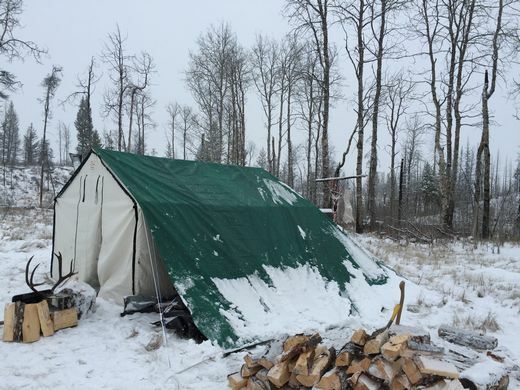 Adriano LaFauchi from Whitecourt, AB sent us this one. 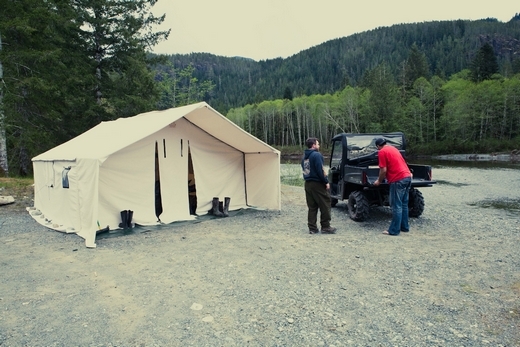 * Whether we’re hunting Black Bears on the west coast of Vancouver Island or setting up camp for fall Moose hunts we rely on the comfort of our Deluxe Wall Tent. 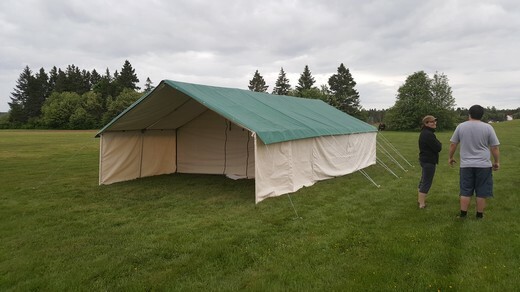 We appreciate your sponsorship towards our group here on The Real Canadian Joes and the tent has been a well used tool in the field. 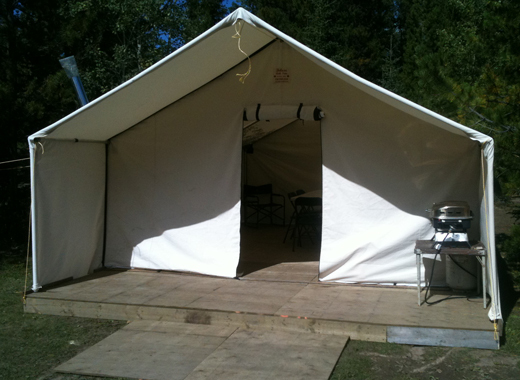 All the best in 2012 and your continued success with Deluxe Wall Tents! 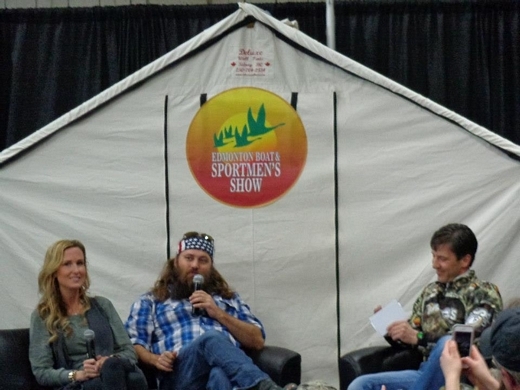 Korie and Willie Robertson from Duck Dynasty sitting in front of a Deluxe wall tent at the Edmonton Sportsman Show 2013. 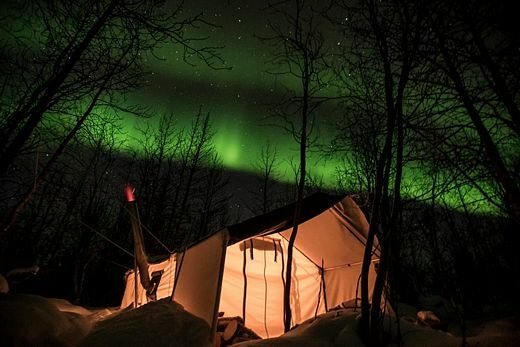 This picture was from the Yukon sent by TJ Schwanky of the Outdoor Quest T.V. Series. 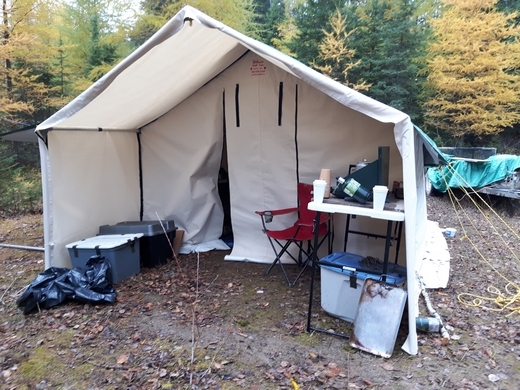 * Wall tents provide much more than shelter, they literally become a home away from home on hunting trips and after spending a season with my Deluxe Wall Tent, I have to say they make one very comfortable home. 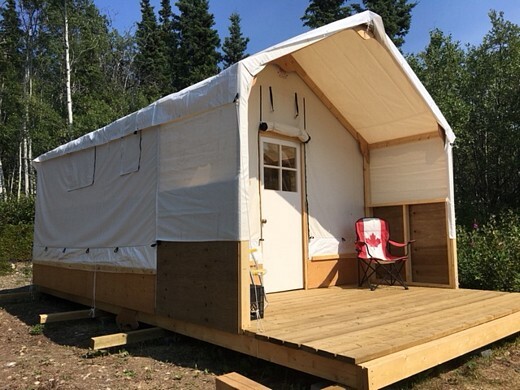 Set up with the internal frame is a breeze even for one person and the small details like the storm windows, drying bar, storage bags, tarps and the huge porch set Deluxe apart from all the others. 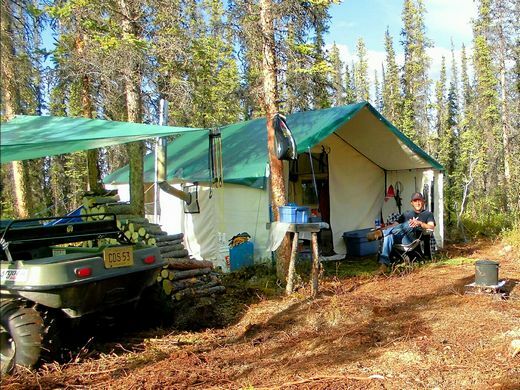 Perry really takes care of his customers and when you order a Deluxe Wall Tent, you receive everything you need to head to the bush. I must admit that I was a bit sceptical about the side wall chimney hole but after using it, I’d never go back. I can get away with less stovepipe and there’s no worry about spark holes in the tent. 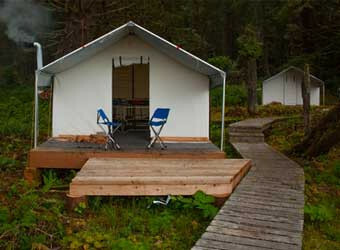 Our tents set up on the famous West Coast Trail on Vancouver Island. Angie Ross from Shylynn Ranch, Salmon Arm, B.C. did an awesome job on her guest tent. 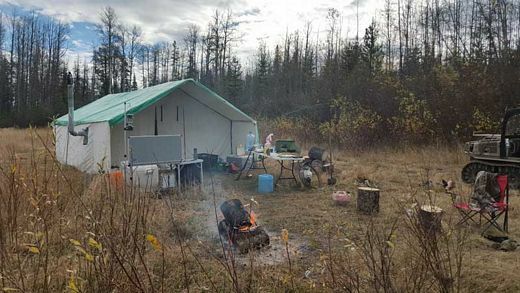 Earlier this year I bought a 12′ x 14′ Deluxe Wall Tent from you and wanted to share a few pictures of my two trips in Northern Alberta. I was the most comfortable I’ve been in 30 years. The tent performed flawlessly. 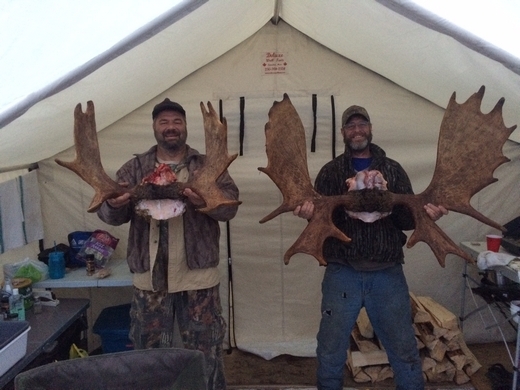 The first trip was a September moose hunt and the second one a November deer hunt. The tent was put to the test. We had everything from a heat wave, rain, snow and 90 km./hr. winds. Our November trip went from -15 with a foot of snow to rain and then -25 with 2 1/2 feet of snow. I can’t stress enough how important it is to anchor the tent and tarp. I almost crapped my pants a few times in the middle of the night with the high winds. I’m so glad I bought a quality product. Please don’t sacrifice quality in the future. Also, please forward my thank you to your family for a great job. 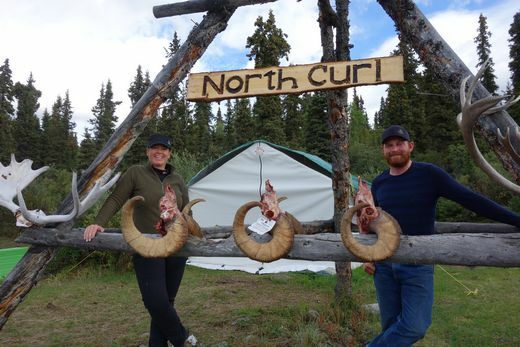 Nicole Richards with her husband and father-in-law hunting in the MacKenzie Mtns. 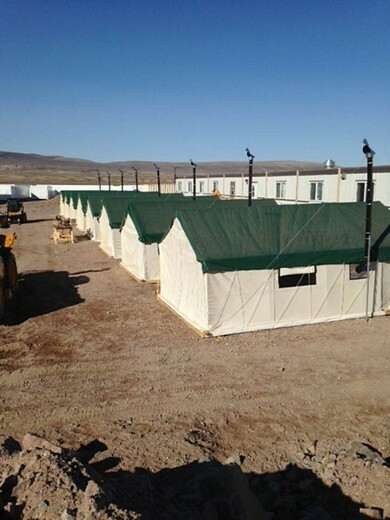 A nice setup of Deluxe Wall Tents at a Horizon North mining camp. 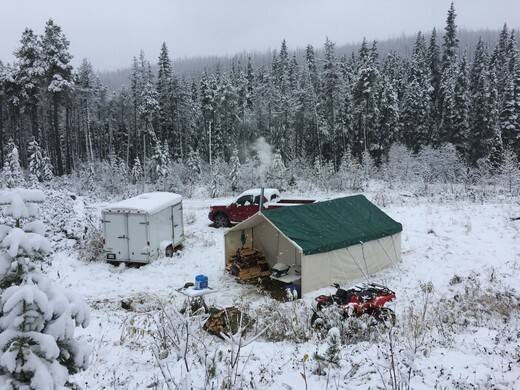 Jeff Mayer enjoying the snow in comfort in northern B.C. Martha Russell from Vancouver Island, B.C. sent this picture of their honeymoon suite. Stephanie Casabar Hamann sent us this pic. Aloha Perry and Sue. We had a lovely warm and comfortable hale (home in Hawaiian) to come back to after hunting all day. My husband Ian just loves the stove with the warming tray. We really enjoyed our coffee with the morning fire. The tent was easy to put up and down. Ian and I thank you for getting us our order so quickly and without any hassles. It was a smooth transaction. Mahalo! By the way, on the way out of our management unit we came across several camps and noted most had your label on them. You guys rock! I’ll be sure to share with anyone interested in getting a good tent and stove, but, most of all, dealing with wonderful people. Take care! Alohas for now. All of us here at Fatal Impact would like to thank you for making such a quality tent. 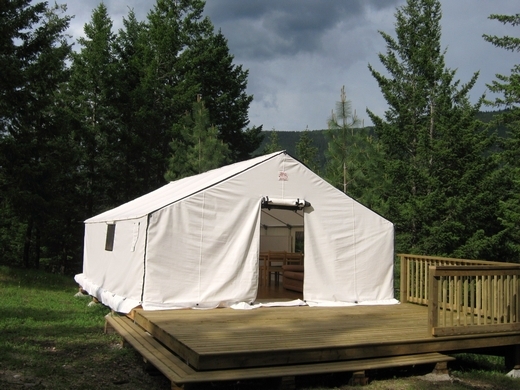 Whether we were in the wide open prairie in southern Saskatchewan, far northern forests of Alberta or deep in the heart of the Rocky Mountains our Deluxe Wall Tents have performed each and every time. One of the challenges we face as a television crew is keeping our cameras and equipment safe and dry and your tents do exactly that. 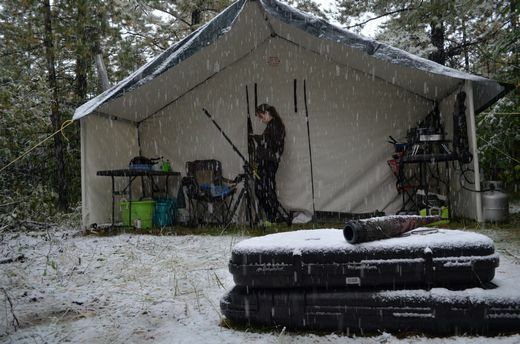 We faced heavy, wet snow, soaking rain and sub zero temperatures with absolutely no issues whatsoever. After 3 weeks straight in the mountains the only comfort at the end of the day was knowing that we were heading back to a warm comfortable home away from home. 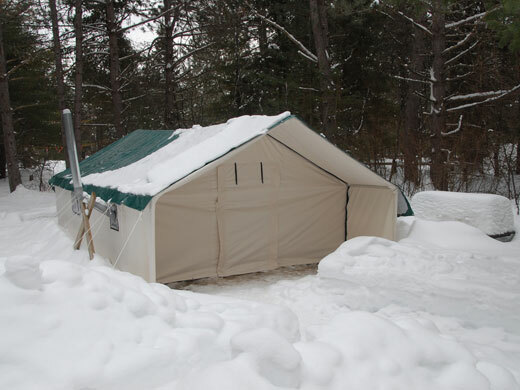 * Deluxe Wall Tents are the Team Shockey choice for our outfitting operations. Quality construction, custom work upon request and attention to detail……these products stand up to the harshest conditions in North America. 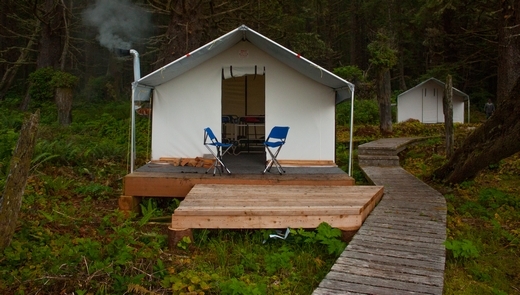 Andrew Gardiner from Vancouver Island sent this pic of his tent and platform. I LOVE my new tent!!! It’s perfect – I am so proud of it! Thanks for everything. Angela Larsen. Everyone loves the tent. Thanks again. 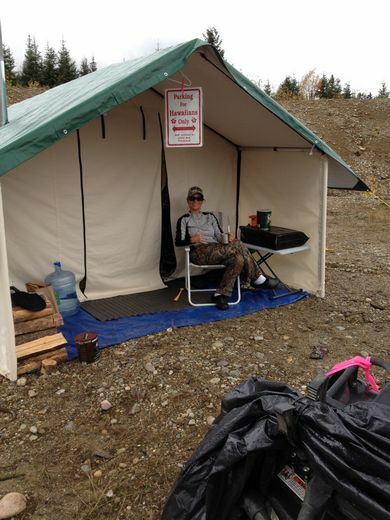 I’m anxious to see how many other Scout troops in area ask us where we got this Deluxe tent. Cheers, André Thériault. Tom Neumayer, a prospector from Austria at his mining camp in the Yukon. Fransisco Vilches sent us this picture from Patagonia, Chile. 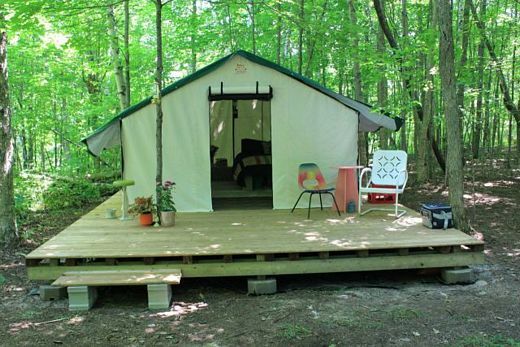 Tanya Bruce from Toronto: I absolutely love the tent. Here’s a link to more great pictures and her blog. 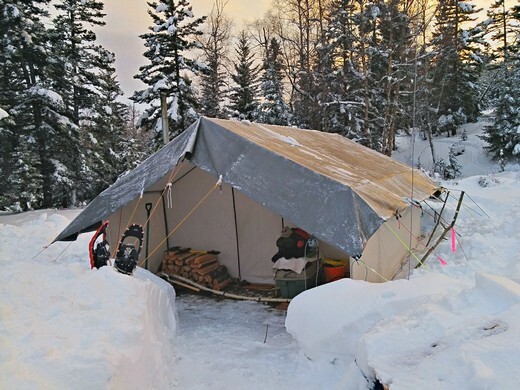 Justin from the Yukon built an insulated entry area with a view over the lake…..
……and recently sent us another pic of his newer tent setup. Doug and Nadine Orr from Vernon, B.C. sent us this picture. The tent was fantastic! We were very comfy and warm. 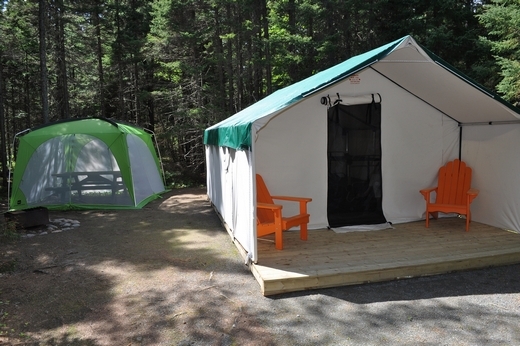 12′ x 14′ is perfect for 2 people. It was so quick and easy to set up. Thanks so much for such a wonderful product. 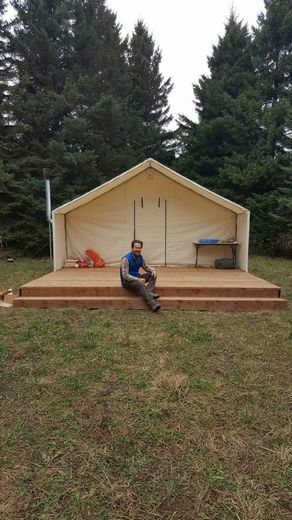 It took a while but I finally got a deck built to place my tent on for the winter. 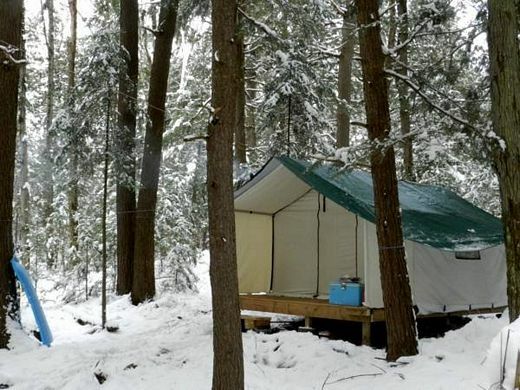 Winter camping may never be the same again! 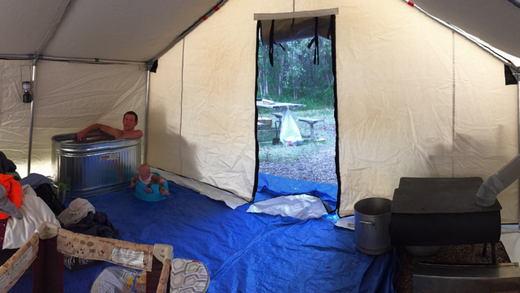 We have been to “visit” our tent every week since we put it up and are totally loving it. It will come down again in the spring before the weekend warriors from the south invade the area, but I am so looking forward to snow shoeing around my property during daylight with a warm space to retire to in the evening when it gets dark. It was like living in a Christmas card, my idea of heaven. Brad Fry from The Guide Life sent us this picture. 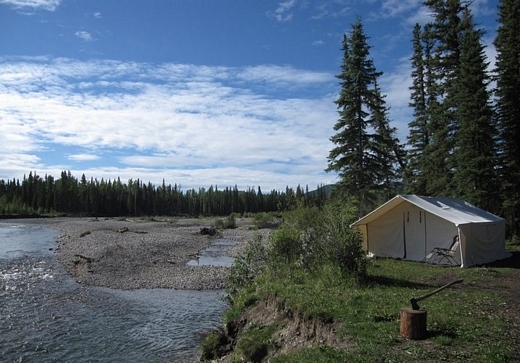 Whether I’m guiding in the Yukon, NWT, BC or Saskatchewan I’m never far away from a wall tent camp of some kind. I’ve had them leak, burn down, leak some more, destroyed by bears and blown away. 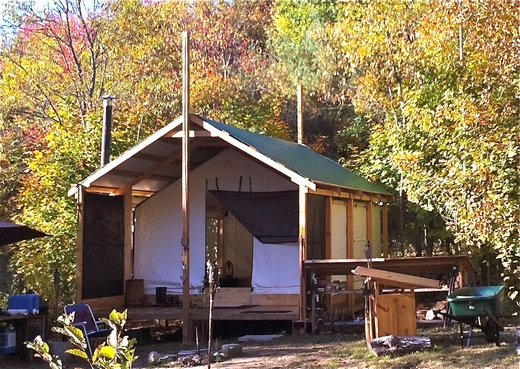 The Deluxe Wall Tent I used this past fall was the best design I have ever used. The internal frame is sweet to say the least allowing for plenty of extra space and along with bulletproof construction in even the most uneven spots. 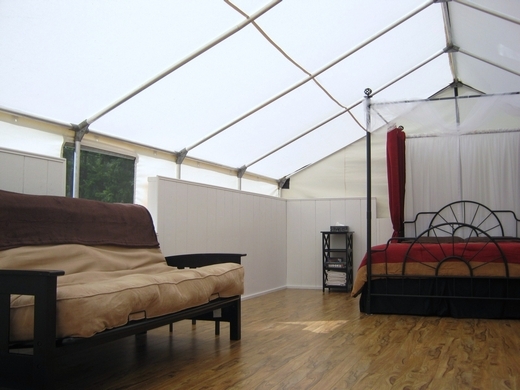 The quality and durability of the tents along with the attention to detail and unbelievable customer service makes choosing a Deluxe Wall Tent a no brainer. P.S. The roomy game bags and slick bed rolls will be with me on my next wilderness adventure. 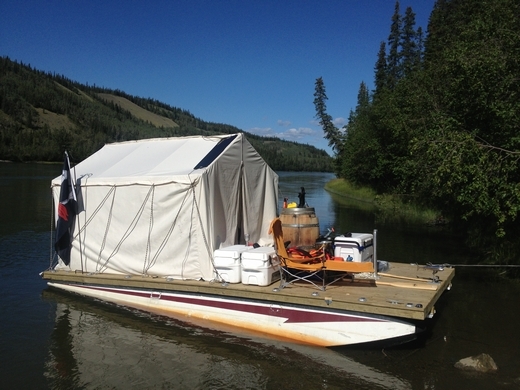 Matt Lacey from Newfoundland sent these great pics of his tent setup. Mario Isita of Indian Head, SK sent this picture from the Island of Capri, Italy. The tent was so easy to set up and take down. I did it myself at 68 years old. It is INCREDIBLY large and it was under a real Mediterranean rain storm without a drop of water inside. We are very, very happy to have chosen you. Next year we want a porch and more. Anne Hutchison from Ontario enjoying her deck. 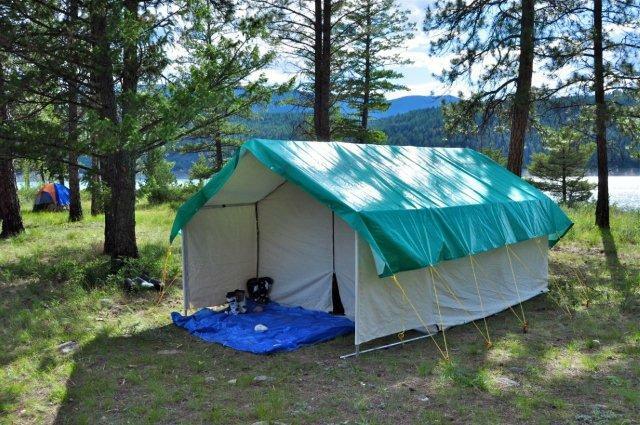 * I bought my Deluxe wall tent and internal frame in 2003 and love it. 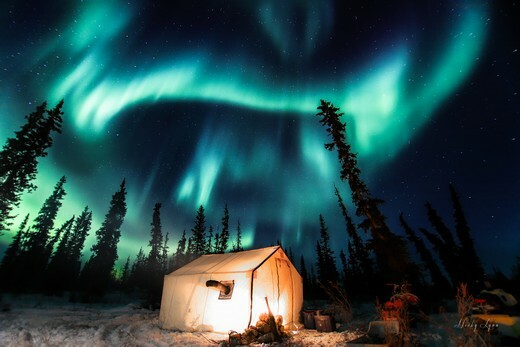 It makes a perfect camp using propane lights and a stove for a kitchen. 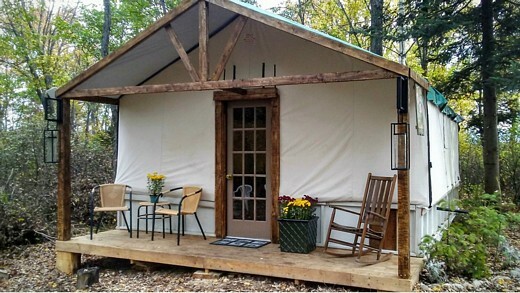 Mine is a 14′ x 16′ with a porch and it sets up quickly. It sleeps four people on cots with lots of room to spare. If you’re looking for a quick dry satellite camp this is it. 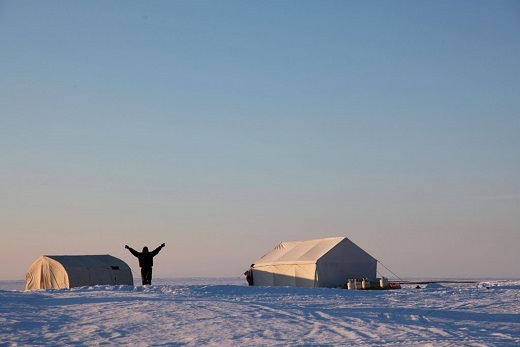 Brian Koonoo from Pond Inlet, NU sent this picture from 700 kms. north of the Arctic Circle. 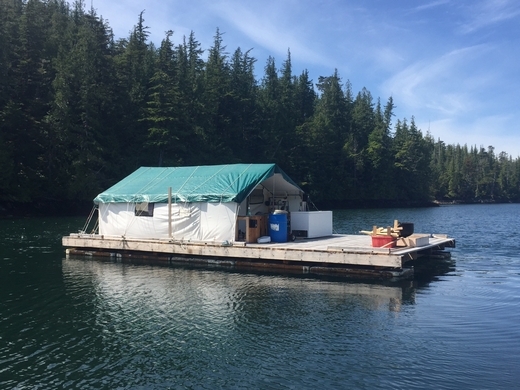 Gill McKean, owner and head guide of Westcoast Fishing Adventures sent us this picture. First I would like to thank the crew at Deluxe Wall Tents for taking great care in sending me all the right gear for the task at hand. The camp was extremely comfortable even in the heaviest rain. The add on that completed the package was the awning. It was a quick set up with all the colour coded aluminum poles and the 14′ x 20′ was a home away from home in under 30 minutes. The woodstove was great for warming us up after a long day of steelhead fishing. 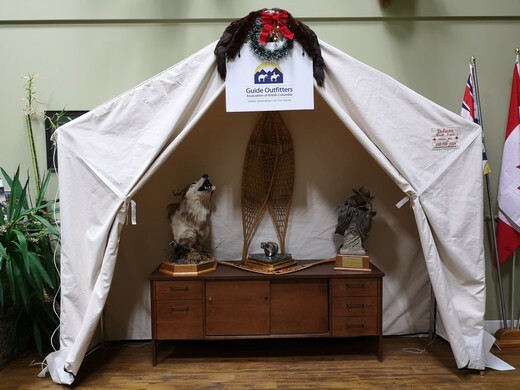 Your wall tent made our season a great success. 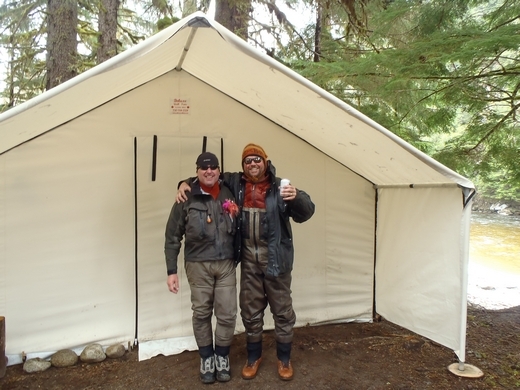 Two of Gill’s happy clients after a day of Steelhead fishing. Hi Perry, you made up a little tent for me last summer on short notice. Here is a picture of the raft on the Yukon River. It was a great trip and the tent worked perfectly! 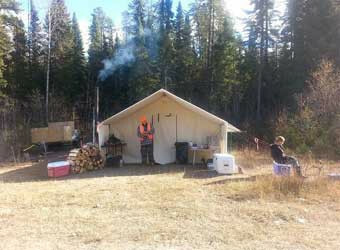 Walking Moose Camp in Manitouwadge, ON, sent from Keith Jenking, Darcy Walls, Chuck Gill & Brad Dault. Pierre Frigon from Alberta Pro Staff sent us this one. 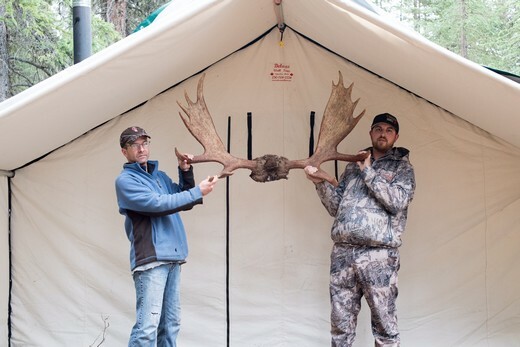 * My moose hunting buddy and I had been using a solid & heavy tent for years, made by an Alberta competitor, but I decided last year that I was getting myself a brand new wall tent, and selected a Deluxe Wall Tent after seeing their ad in the Alberta Outdoorsmen magazine. I opted for the 10′ by 15′ Deluxe model (with 8 foot center and 5 foot walls), and little did I know as to what I was about to get! The tent was shipped real promptly & I set it up in the back yard as soon as I got it. I could not believe all that came with it… Lightweight durable aluminum tubular frame, 2 XL windows, two locations for the stove pipe, 5 foot porch extension, clothes drying rack, a heavy tarp which covers the whole length of the roof section, zippered screen and zippered door, heavy storage bags for the tent & frame, and above all, a sturdy, lightweight and durable cloth material. The workmanship in the sewing is second to none. 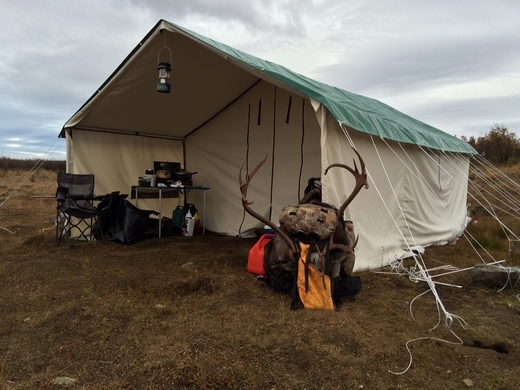 In the first few days of last year’s moose hunt – we were battered by 3 days of hurricane type winds. The tent never budged and showed no signs of stress anywhere. Absolutely remarkable. As the trip was nearing the end – it rained on us solid for 2 days, and the rain quit with less than a day left in the trip. 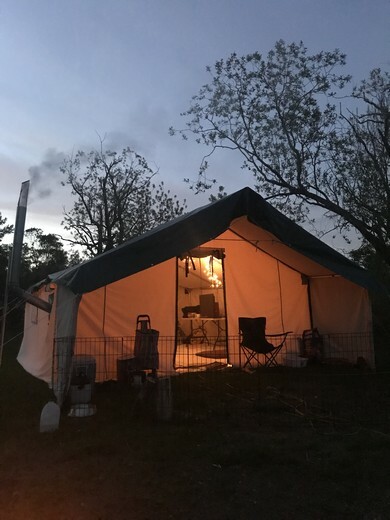 I was later floored when I realized that the tent had completely dried out in less than 6 hours – something of utmost importance when selecting a wall tent. I loved it so much that I ordered an 8′ X 10′ Deluxe Model this year, with extended porch, perfectly suited to horseback & ATV trips. I invite every serious outdoorsman to have a hard look at this great Canadian made product. You will not be disappointed! 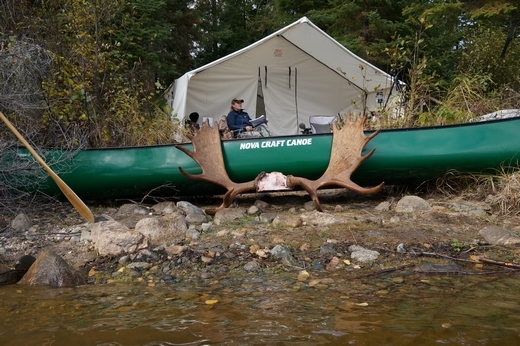 Click on https://www.albertaoutdoorsmen.ca/pro-staff-of-moose-and-fires.html to read a great story Pierre wrote involving one of our tents. 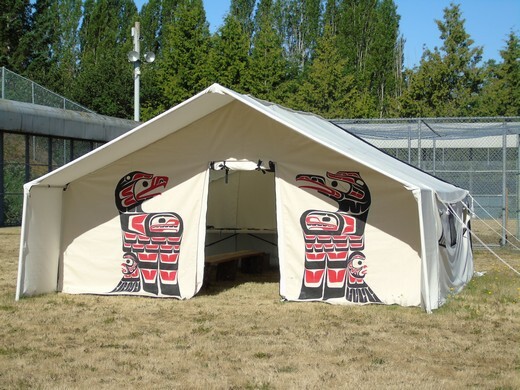 Our tents being used by S.O.S. 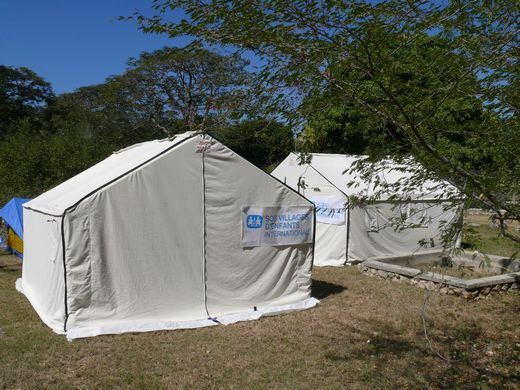 Children’s Villages for earthquake relief in Haiti 2010. 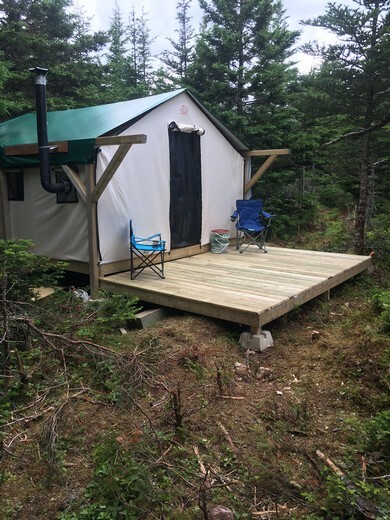 Stetson Broderick from Twillingate, NL Great tent, thanks. Zach Best from Calgary, AB sent this picture. Just wanted to say thanks again, the tent is fantastic. Set up was quick and easy. The family loved it, can’t wait for Oct./Nov. 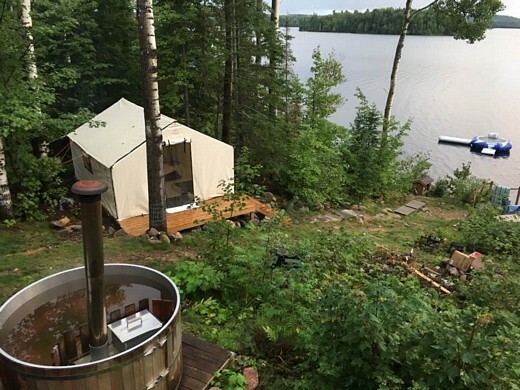 hunting camp. Don Hoddinott from Ontario sent this picture. 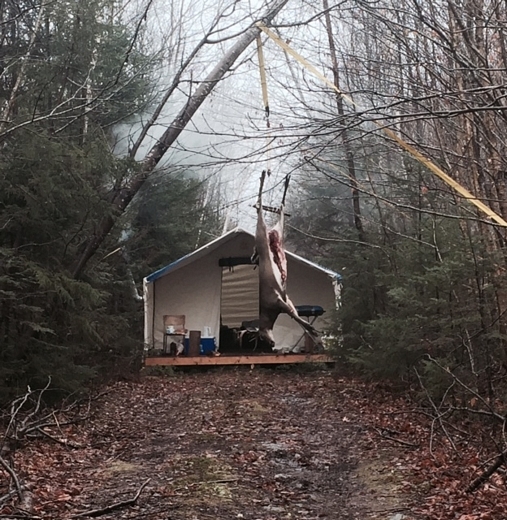 Joanne sent us this pic of their tent and platform setup. 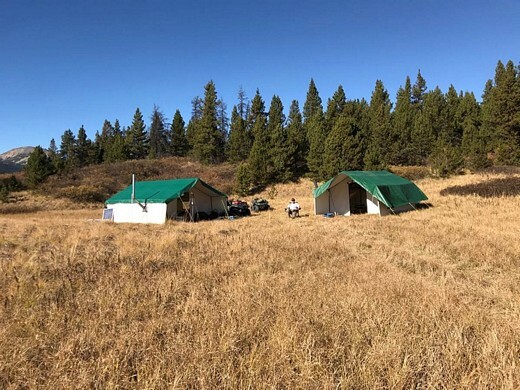 Carl Gutsche sent this picture of his mule deer camp. 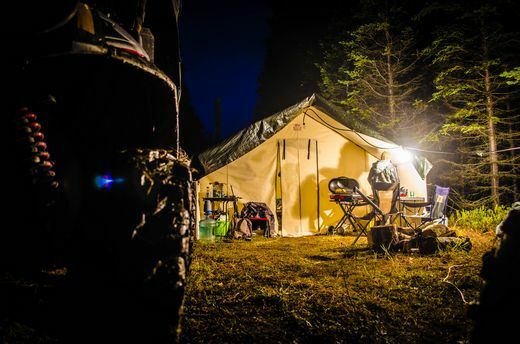 We put our wall tents through the paces over the 2016 season. 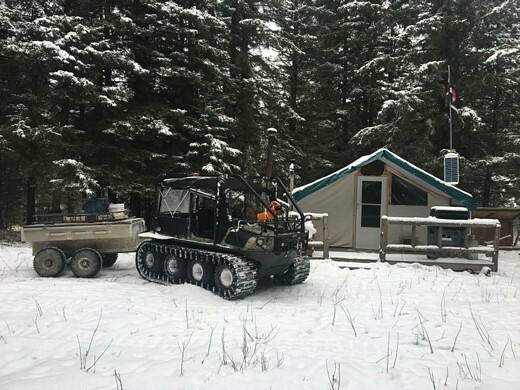 From our own hunts in Northern, AB to housing clients of our outfitting business, Willmore Outfitters, they passed all tests with flying colors. The entire staff here at WildTV, Rawhide Hunting & The Edge TV were absolutely thrilled with the products performance. Perry is exceptional to work with and I would highly recommend Deluxe to any and all of my friends and clients. 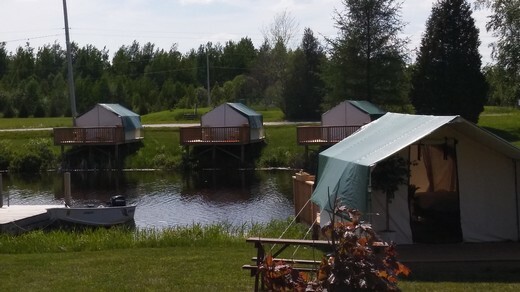 Andy Shapack of Toronto sent us these great pics of his tent & platform setup. The 40th. National Dene Assembly in Fort Good Hope, NT. This picture from Jill Conner, Rimbey, AB. I’ve now been thru a blizzard in April, lots and lots of rain and snow and smoking hot summer days! And I’m warm and dry. My neighbors have all come over with lots of ooh and awes and want a tent of their own. 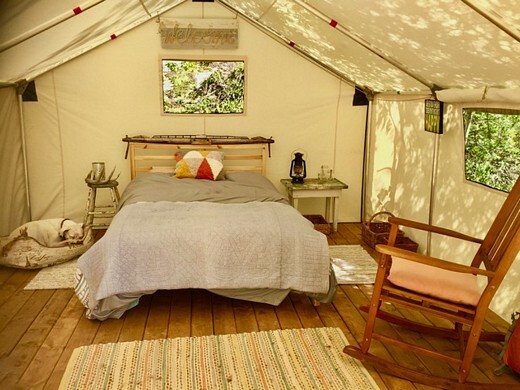 * FYI – the tent was awesome. 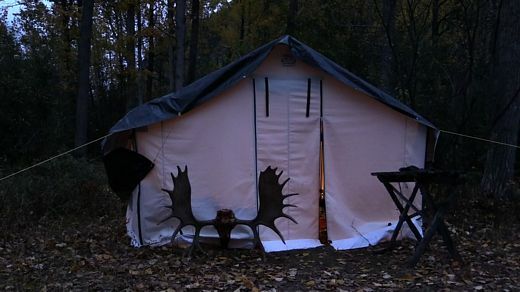 We got back from a week long moose hunt and I am so happy with the tent and frame. Added floor was an excellent option. 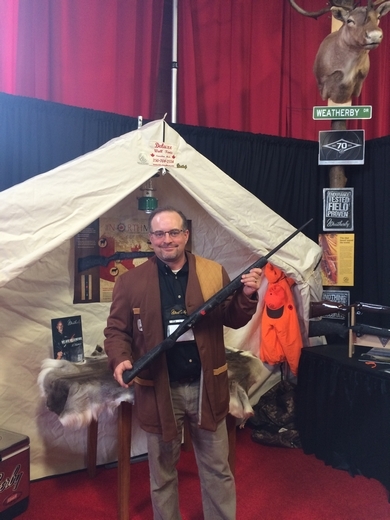 We met some other hunters out on the trail and gave them a tour of the tent and referred your company. They were also impressed. Thank you. Jerry from Inroads Mtn. Sports sent this picture. Thomas Sallows from Mountain Man Adventures sent us this picture. 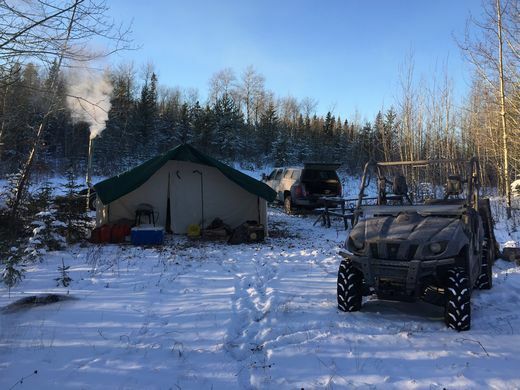 As a hunting outfitter in Northern Alberta my operation relies on the ability to supply comfortable, warm and reliable camps in very remote areas. 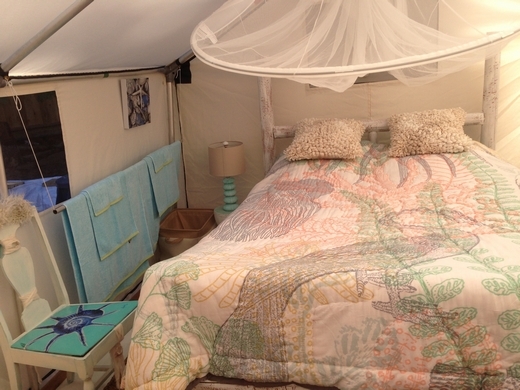 Deluxe wall tents are perfect for this. 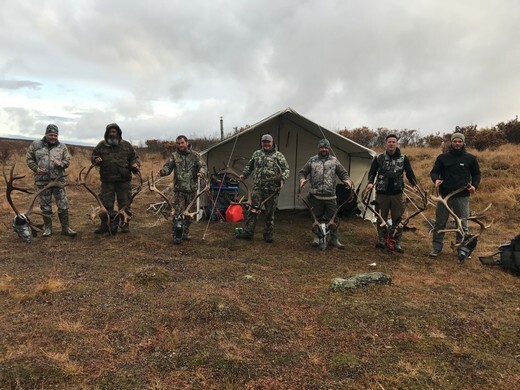 With the tent and frame we are able to produce a top notch camp and use limited time for set up/take down so no hunting time is lost which is a must. Our clients have nothing but good things to say about our kitchen and sleeping accomodations. TJ Schwanky & Rich Mellon from Outdoor Quest TV at the Calgary Sportsman Show, 2011. 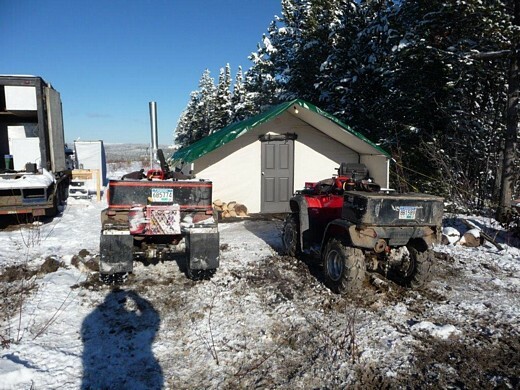 Rich Mellon also sent us this one of his hunting camp. Nicole Daigle from Kouchibouguac National Park sent us this picture. 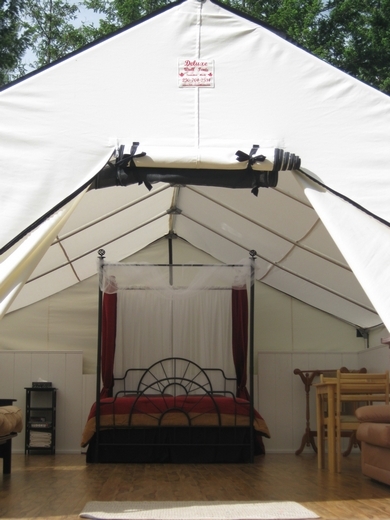 The Fever would like to thank Perry and Deluxe Wall Tents for their sponsorship to our television show The FEVER. 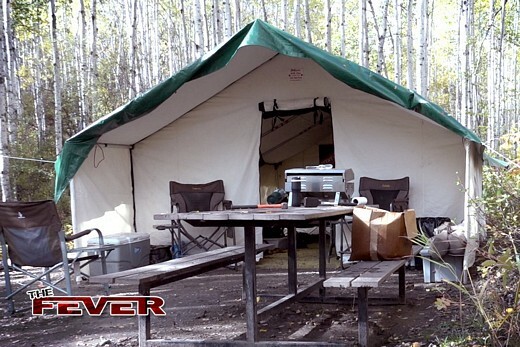 Deluxe Wall Tent has a strong durable structured frame that’s our second home when out on any of our hunting trips. 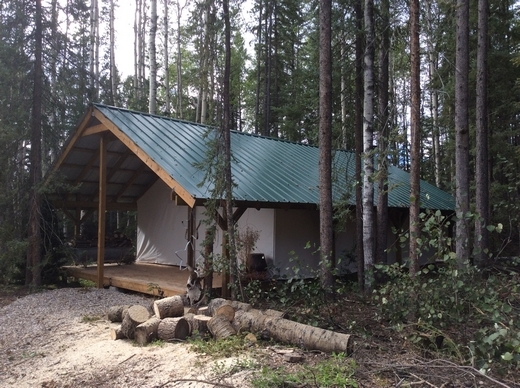 If it’s set up for a month during bear season, and having it home sweet home each year during our hunt camps. 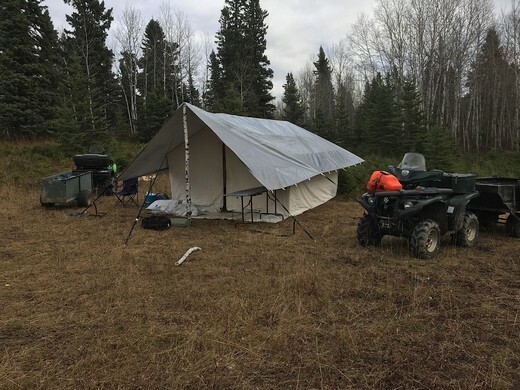 Deluxe Wall Tent is easy to assemble with the comfort of home that makes for a good well deserved rest before we get back out and look to fill another tag. This one from a customer from Manitoba. 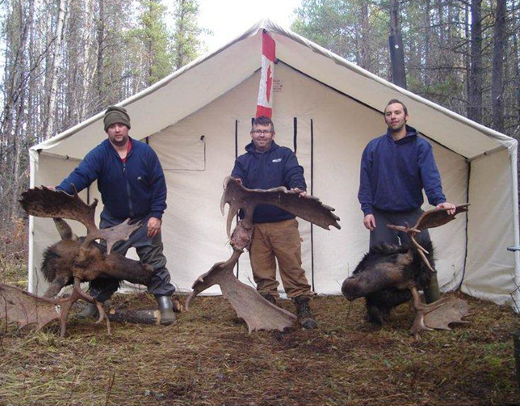 A successful moose camp in a Deluxe Wall Tent sent from Dale McLean from Coldstream, B.C. 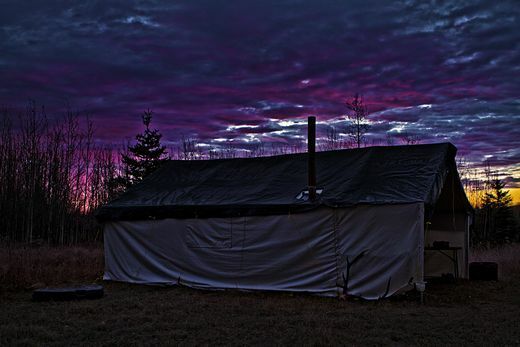 This one is from Ray Hubble of his deer hunting camp in Ontario. 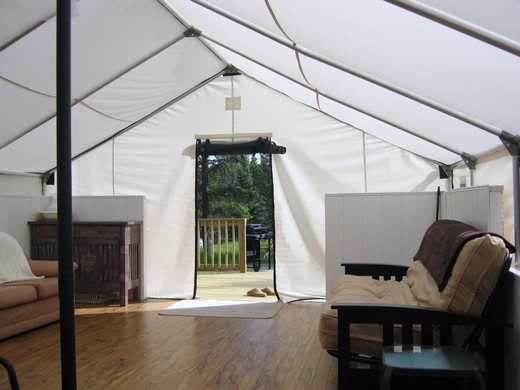 The tent has a porch that butts up against the front wall. I want to thank you for the quality equipment that I purchased earlier this year. 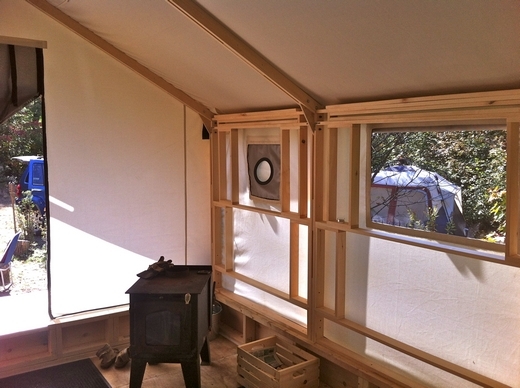 I purchased a 12′ X 14′ x 5′ deluxe wall tent with a 5′ porch and wood stove. 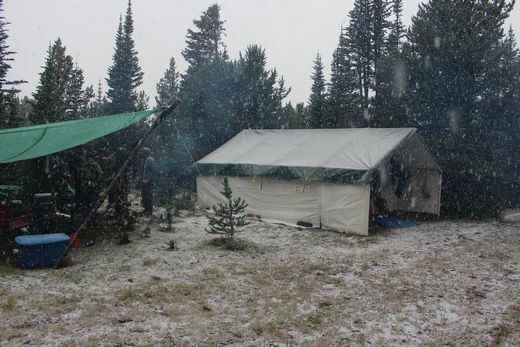 We were warm and dry when the weather was raining and / or snowing for 6 out of 10 days. 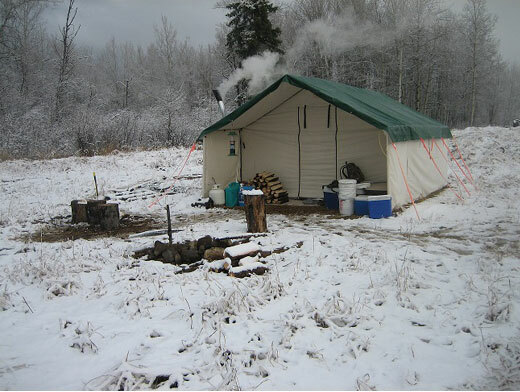 I have included a picture of the tent amongst the rest of my moose hunting camp. You can use me as a reference, as I believe you have a great quality product. 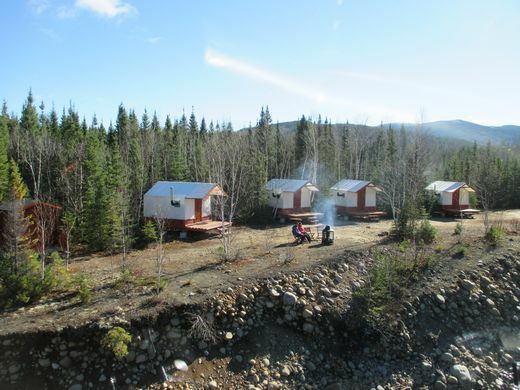 TJ’ Shwanky’s and Vanessa Harrop’s camp in the Yukon fall 2011. Surviving the deer woods in the Deluxe and a successful hunt to boot. 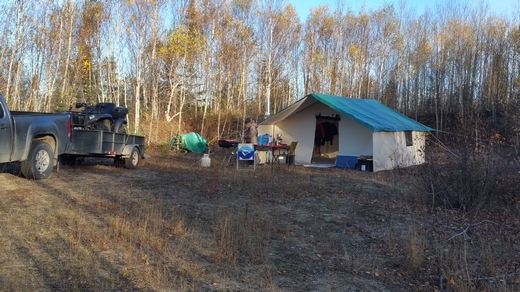 I want to tell you about the great experience we had hunting this October thanks to your amazing tent! 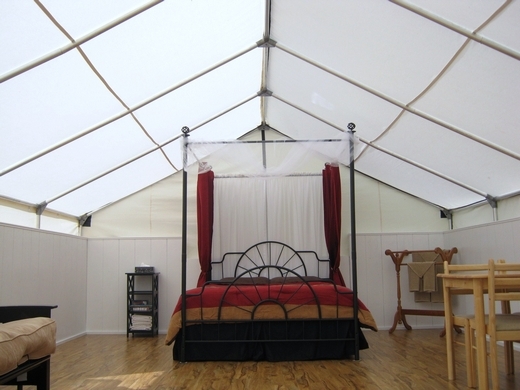 I’ll be honest, I thought my husband, Tom Corbett, was crazy spending the money on this tent, but it was his money so I said whatever! I couldn’t believe how nice and roomy it was. We stayed warm and dry and I must commend you on the beautiful Canadian Quality you’ve packed into this item! When Tom first got to the place we were staying, it started pouring as soon as he unpacked the tent. It took him under 45 minutes to get everything up. Our dogs definitely loved it too. We bought a kerosene heater, which worked great, but we are going to get a stove for next year from you. 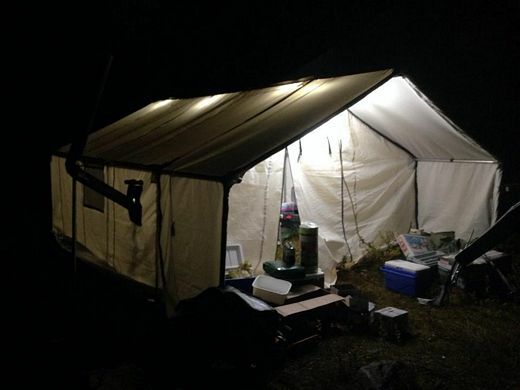 Two years ago and 2 weeks earlier in October, I managed to tough out 8 nights in a large regular nylon tent, with no heater. Luckily, it was milder but the nights were brutal. I would not have made it 8 nights this year and I probably would have gone home if we didn’t have this tent. That would have been pretty unfortunate, seeing as I was the one holding the bull tag!! Unfortunately, we did not shoot that wily moose, but I did get really good at loading and unloading my rifle. Again, thank you for making such a great product and I’m proud to own such a fine Canadian Made product. As you can see, I am in Sales. If I ever move out your way I could sell these all day long! Keep up the good work! 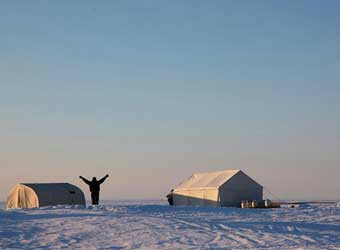 Hey Perry, this is a pic of our camp in Newfoundland. 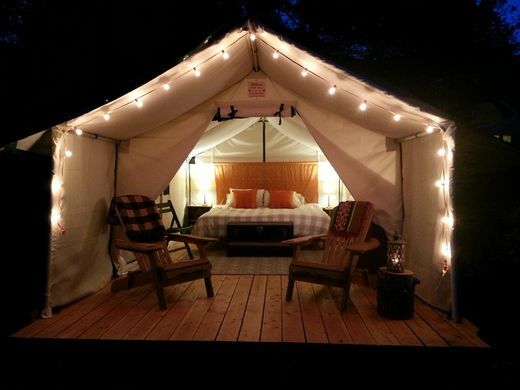 The tents could not be better. Michel Gautier from Trois Riviers sent this picture. 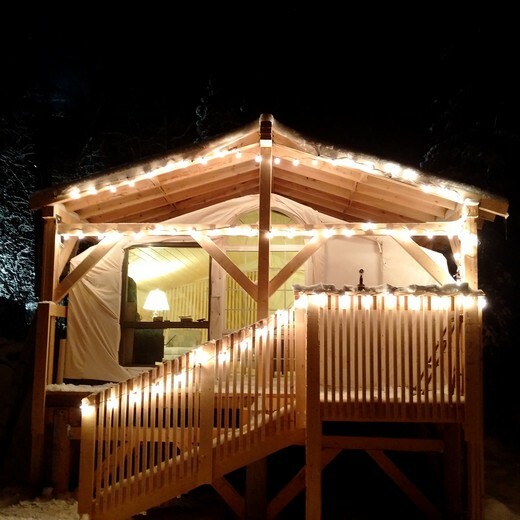 Here is a picture of my installation in Lac-aux-sables, Quebec. 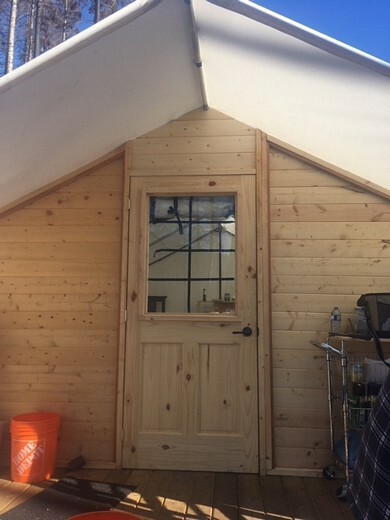 It is a 14′ x 12′ model and we are so proud we have chosen your product. The quality of the structure and the canvas are obvious and all our visiting friends are impressed at first sight. We’ve been every 2 weeks last winter with temperatures down to -25 celcius and it was just a matter of having good dry wood in our Outfitter stove to stay comfortable. Shipment was fast and convenient and we look forward to doing business with you guys again. 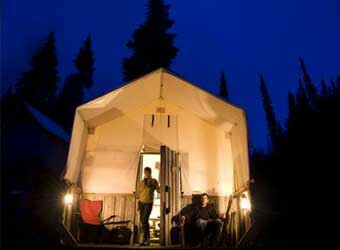 Deluxe wall tents used for comfort camping at Dinosaur Provincial Park in Alberta. Jason and Kevin Spenst of The Hunting Chronicles T.V. show. The Hunting Chronicles crew spends numerous hours in harsh elements chasing a variety of quarry. We chose Deluxe Wall Tents for their durability, comfort and quality. The aluminum frame makes set up quick and easy. 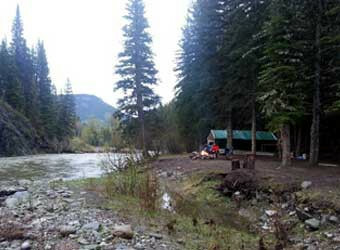 This picture is from our hunting camp in the Rocky Mountains. 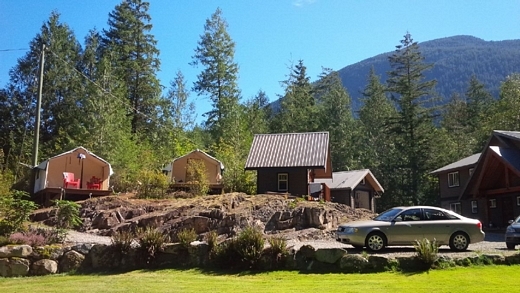 This season we are planning a November goat hunt in B.C. 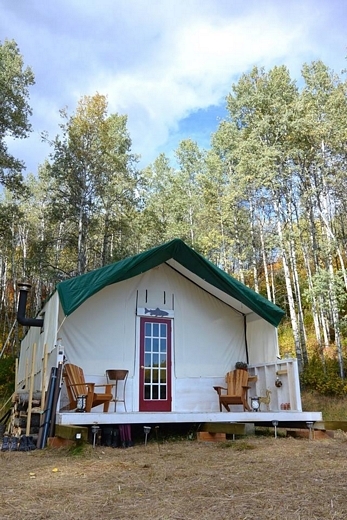 and a prairie mule deer hunt and you won’t catch us without our home away from home. 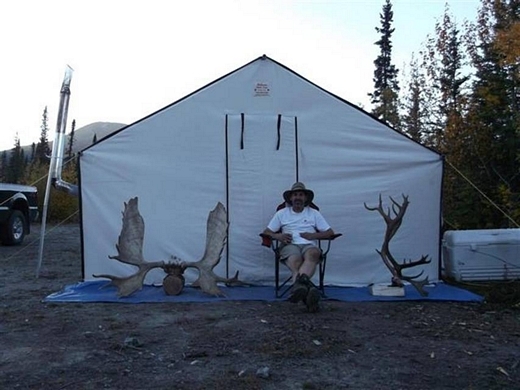 Mike Burns of Fort St. John, 2012 winner of the Hunting BC raffle, sent us this picture. 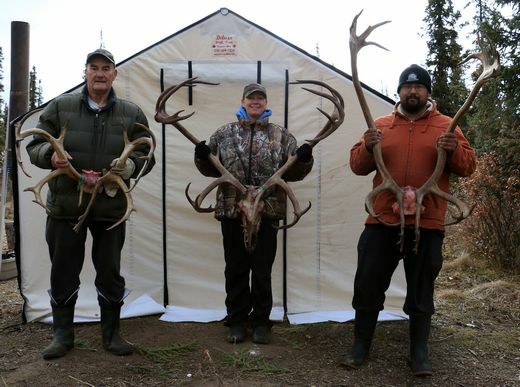 Steve and Jackie Shore of Hitmen Canada sent in these three pics. 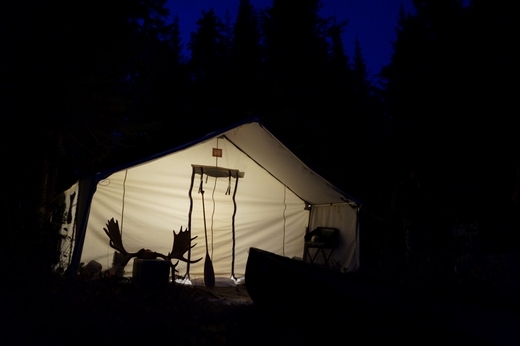 We’ve used our Deluxe Wall Tent for Hitmen Canada for a bear hunt up in Northern Ontario as well as for a moose hunt. We were all amazed at the quality of construction as well as ease of set up. It took less than half an hour to get the tent set up. We were all very comfortable and had lots of room to move around. 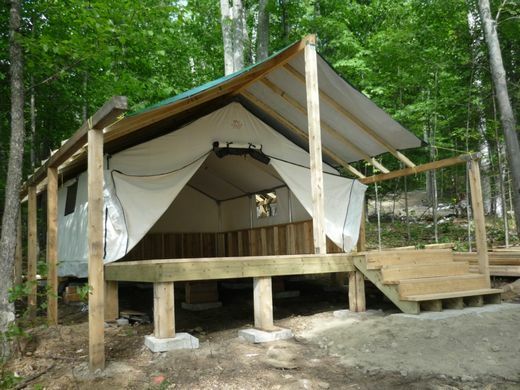 We can’t wait to plan our next trip with our Deluxe Wall Tent. Myles Bruns sent us this one…. Thought you guys might enjoy a photo of our tongue-in-cheek camp last year. 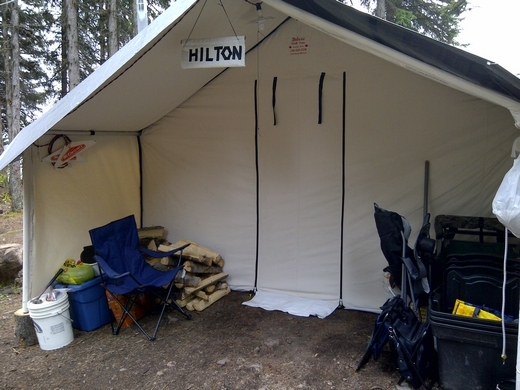 We had a couple of visitors to camp one day and they remarked on the quality of the wall tent and the “Hilton” like set up (solar powered electric lights, woodstove and hot water). One night after dinner I made this sign. You make great tents and I am looking forward to more time in it this fall. Hannah Bedford from Damdochax River Lodge sent us this one. 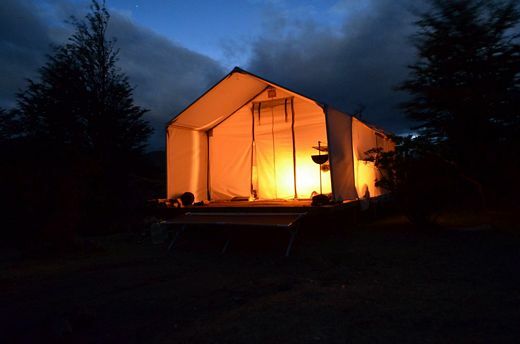 * Newfoundland Coastal Safari operates Atlantic Canada’s only wilderness tent camp on the shores of Fortune Bay in the Newfoundland South Coast Wilderness. 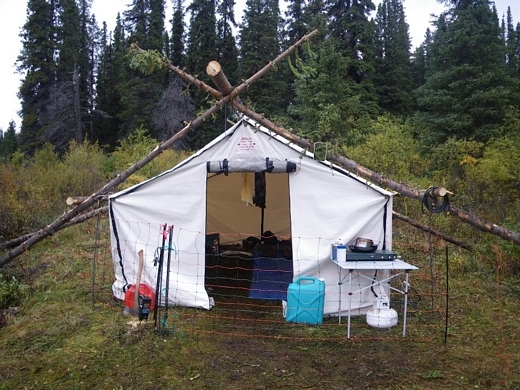 In 2004 when we decided to upgrade from poles to an internal frame system for our 12 x14 tents we did a lot of looking on the internet. 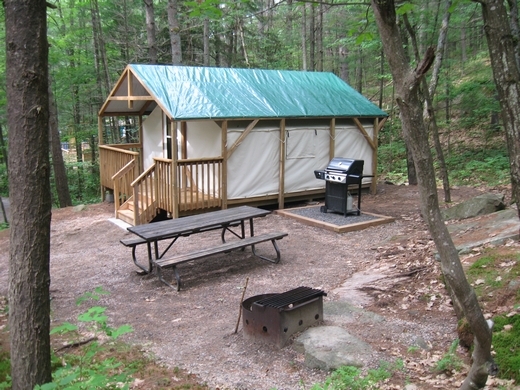 With only a few weeks to go before the start of the 2005 tourist season we finally decided on Deluxe Wall Tents. They shipped us one unit by air and we quickly assembled it in our backyard. Everyone that saw it was impressed including us. We ordered five more units and they worked out great. 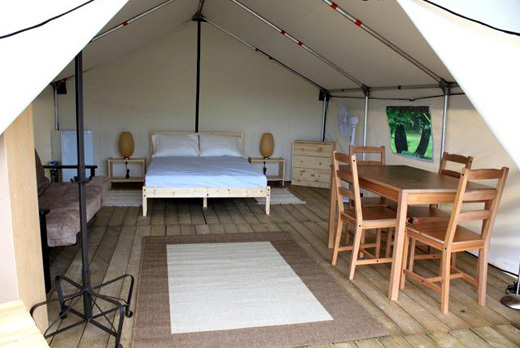 Our six tents sit on wooden platforms and are up from June until September. We have had no problems. A Great product! 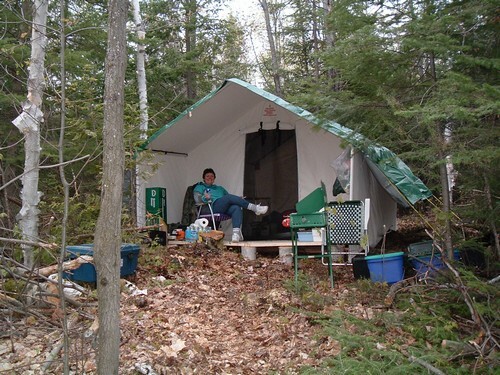 I recently purchased (spring 2010), one of your deluxe wall tents, and have never been happier to be out in the bush.. set up is a breeze, and take down is just as easy, nice to see that someone finally made a pack bag big enough to fit your tent into without having to vacuum pack it before trying to jam it into the storage bag. Wife thanks you, I thank you, and the dogs love it. Here’s a picture. I’m now trying to convince my wife we need one of our own. You folks make a quality product. 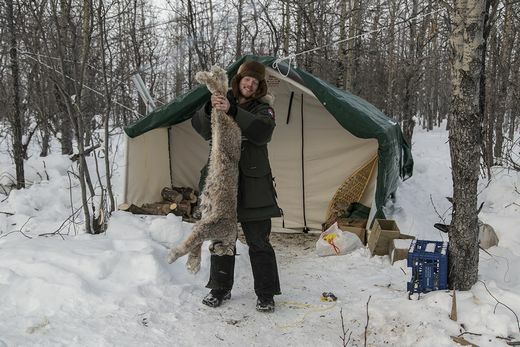 Here is a link to some pictures I posted on Alberta Outdoorsman. Hope it results in some sales for you folks. 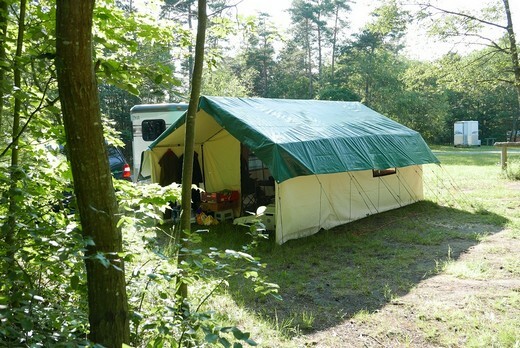 * We bought our tent and frame a few years ago and have found it to be everything we had hoped it would be. 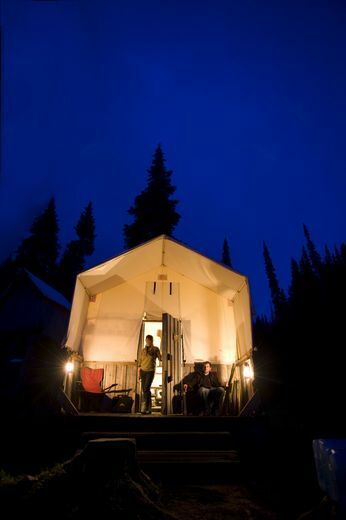 There have been more than a few occasions when we have spent the night out in it while a west coast storm was blowing through and we stayed warm and dry. 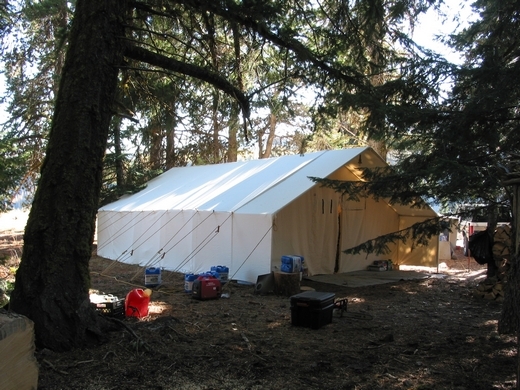 * Our hunting group invested in our 14′ x 20′ Deluxe wall tent in 2006 and already know it will give us nothing but years of durability. 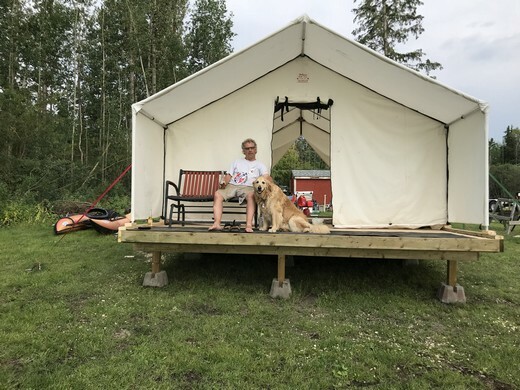 The tent is nothing but real made-in-Canada quality and the level of customer service we experienced was above and beyond what the competition could have offered. 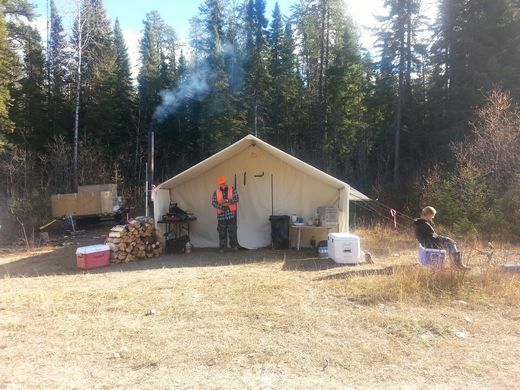 The larger tent offers plenty of room for 6 – 8 of us and all the gear required for a Peace Country elk hunt. Great tent! *The first time I put my tent up with the aluminum frame, I was impressed to discover that I set the whole rig up, covered with the tent, within a half an hour-all by myself. Take down was just as quick if not faster. With some more practice, I expect to be able to have my tent ready to go within about 20 minutes with no help at all. The only recommendation I could make is to ensure that the instructions mention to assemble the frame one square roof section at a time. Part of my time was spent fiddling around putting the the green poles together first and trying to line them all up with the red poles rather than assembling the frame a section at a time. I’ll know better for next time. Coupled with the excellent service and quick communication from Perry when I had any questions, this purchasing experience has far surpassed my expectations. Considering the fact that I live about 1400 km North of Vancouver, I have been more than impressed by the quick delivery and the fact that Perry stands behind his product even though I’m so far away. I can’t wait to take my tent into the bush. * Hi, Perry. I just wanted to let you know how pleased I am with the tent. 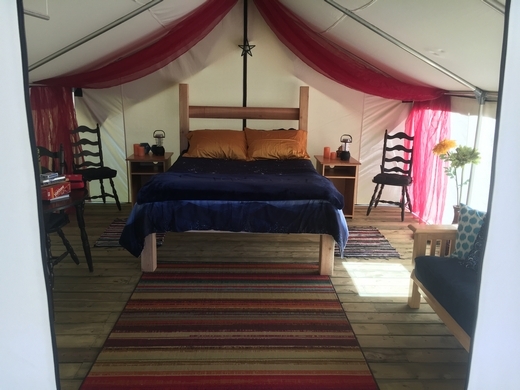 I just came home from a ten day trip and tent was amazing. In rain, snow and wind it performed flawlessly and was truly deluxe! Thanks for a great product! 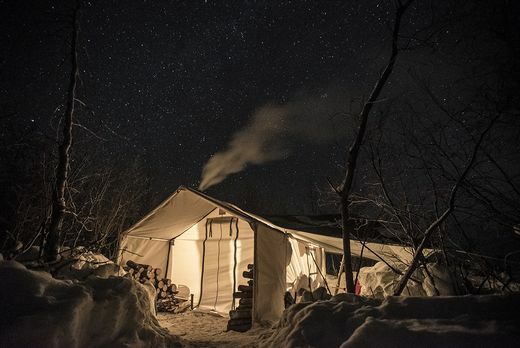 * A little bit of space seems to feed the soul in moments of solitude while camping during the winter. 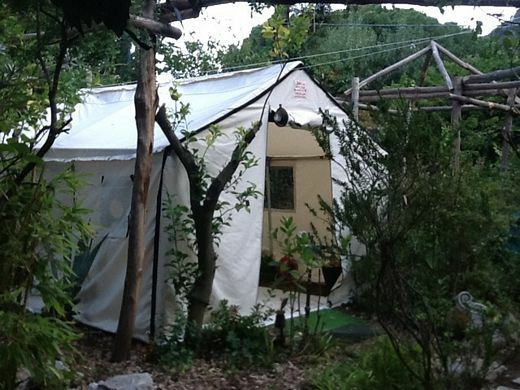 While living in a communal house with constant movement, it’s rather difficult to maintain focus while working at home, the space that the 16’x14’ tent offers that I lived in throughout the winter was a beautiful escape from the everyday social life. In November I realized that I wanted to move out of the house that I was living in, but wanted to stay on the land. There are quite a bit of options when it comes to living outside of house walls. 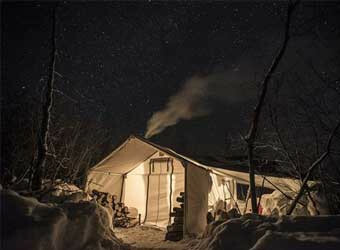 A trailer crossed my mind, maybe a camper, yet as soon as a friend of mine recommended a tent I felt like that would be a great way to spend a winter, as well as the following seasons to come. 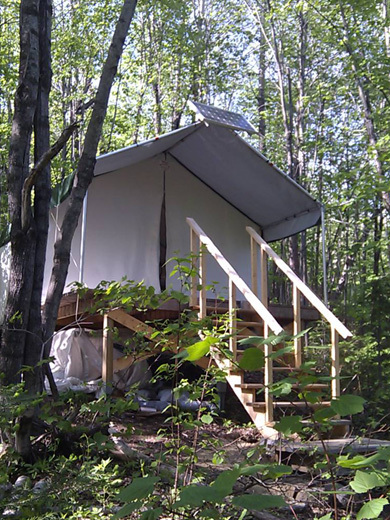 A portable home was exactly what I was looking for, and with a transient lifestyle, moving from farm to farm, with potential in the future of exploring the back country camping my way through the bush on horse back, a tent began to make more sense for the lifestyle that I’m intrigued about. 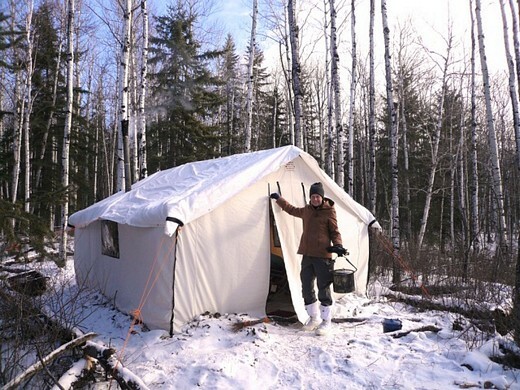 While growing up as a kid my dad and I would go winter camping every year, and we slept in a similar wall tent, a bit smaller though. I chose to get a rather large tent because it’s my full time home. 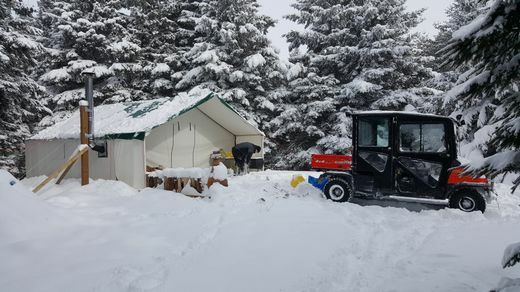 I setup up under a structure that a friend had built for last winters living he had in his airstream, with a solid wood roof overhead I didn’t have to really worry about snow accumulation on the actual tent, I think we got about 4’ of snow in total this past season. Next step was to build a platform for the tent to go on, so I built a typical floor using 2×4 and t/g plywood, and had it raised above the ground about 12”. 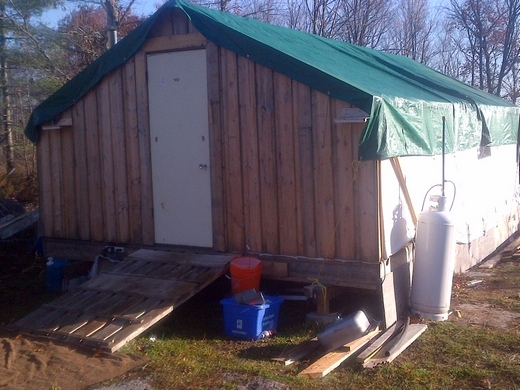 Once that was all setup it was time to get the tent up, once raised I moved in the stove and setup a sleeping area, shelving units around the perimeter, with a table next to the woodstove in front of the window. I stocked up my woodpile rather high, unsure as to how much wood I would be using during the winter months. I found a wood stove for rather cheap in a neighboring town meant to heat a space double the size of the area in the tent. I figured with no insulation on the walls, a lot of heat would be lost, yet during the first cold snap sometime in December it got to near –20 in the depth of the night. To my surprise the tent kept incredibly warm, comfortable to sleep in, with the early wake up stoke the fire routine maintained I was cozy and warm every night. I’m currently in the process of packing it up to move to another piece of land where I’ll be living in it from now on, until I go traveling sometime next year perhaps. 16’x14’ worked out to be a comfy environment to inhabit, everything is close by, with enough space to stretch and move about with ease, as well as have company over for tea.